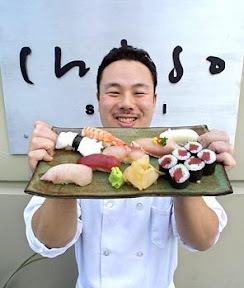 In January, I ate one last omakase meal at Chiso Kappo before Taichi Kitamura sold the original Chiso, closed his upstairs operation Kappo and put an end to his stunning one-man-show in Fremont with plans to head to Eastlake. On Sunday, Tamura Sushi Kappo made its public debut serving dinner only at the Ruby condo complex across from the Eastlake Bar & Grill , and on Monday I was seated at the sushi bar taking it all in. Taichi Kitamura (left, center) presides at 2968 Eastlake Avenue East where the new Tamura is more Chiso than Kappo. I was one of many customers Taichi greeted warmly by name, and the pretty young blond who strode in to unwittingly join me at the sushi bar was as impressed with that as she was with her new favorite hang-out (she lives upstairs at the Ruby). “When I told my friends how excited I was to have a sushi bar right downstairs,” she told me, “They said: `Yeah! Do you know who that guy is? '” She didn’t. But she was learning fast. Taichi then (in Fremont, left, Seattle Times photo by Thomas James Hurst), and now, at Tamura on Eastlake. After professing her love for kaiten and acknowledging a learning curve when it comes to eating high-end sushi, my new friend (right on!) bravely ordered a pair of live B.C. spot-prawns at the behest of one of Taichi’s sushi-making sidekicks. “I hope it’s not live when I get it!” she confided, sotto voce. It wasn’t, and when I suggested she might soon be chomping on the sweet shrimps’ fried heads — like the happy couple seated to my right had just done — her eyes got bigger than the shrimp’s. Meanwhile, all around, patrons made themselves at home in the new digs, whose name nods to Taichi [hold the “Ki” in Ki-tamura] and to his business-partner Steve Tamura, the restaurant’s manager. The main dining area at Tamura (left), and a smaller, semi-private spot at right. I like to let my sushi chefs have at it and almost always order omakase. But you knew that, right? Wondering where to begin here, I ordered a carafe of chilled sake and looked over the menu, long on daily specials from near (Skagit River Ranch pork rib, local albacore tuna sashimi) and far (Alaskan white king salmon, Maine sea urchin). In the end, I opted for the $60 tasting menu, providing a wide-range of tastes and textures and dishes hot, cold and in-between. A sweet shot of honeydew melon juice (left); and seared geoduck with grilled king oyster-mushrooms and organic mizuna dressed with yuzu umadashi. Gently steamed Skagit River Ranch chicken jibuni with a millet-crusted mochi cake and daikon radish oroshi (left); and soy-basted Sitka Sound white king salmon yu-an yaki. The chef’s selection of sushi nigiri (with a specially requested add-on, sweet uni gunkan), left; and dessert — a Japanese take on panna cotta: almond custard with palm sugar-syrup, garnished with goji berries and longans. Dinner was delightful, as was the company on both sides of the sushi bar. And while I’m certain my husband won’t be the only one to complain about the loss of Taichi’s intimate Kappo in Fremont (I’m still cryin’), there are others who won’t be complaining when I tell them that second-story space in Fremont remains vacant — and Taichi told me he’s thinking he might just turn the place into an izakaya.